Registration is now closed. Please email info@ndchicago.org if you would like to attend. 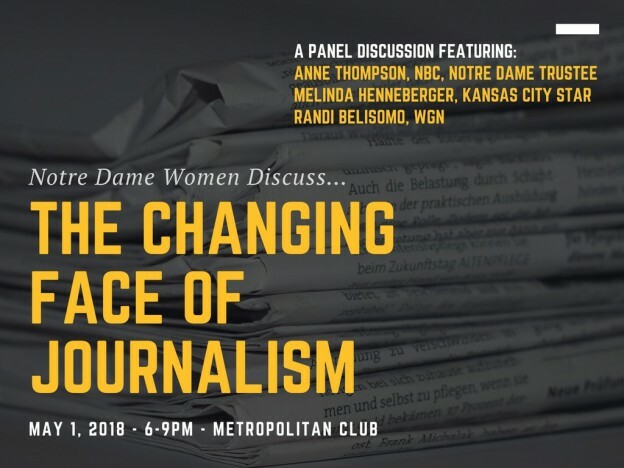 Join the Notre Dame and Chicago journalism communities in an amazing event featuring three prominent Notre Dame Alumnae working in journalism. This is your chance to hear about the contributions of Notre Dame graduates to the field through their stories and their take on the industry. In the panel discussion, these three women will provide insight into how the profession is evolving - from who is reporting to how and where the stories are told. Following that, look forward to a great discussion through an open Q&A session. All are welcome.